Saturday Night Widows Available At The Pearl Library! 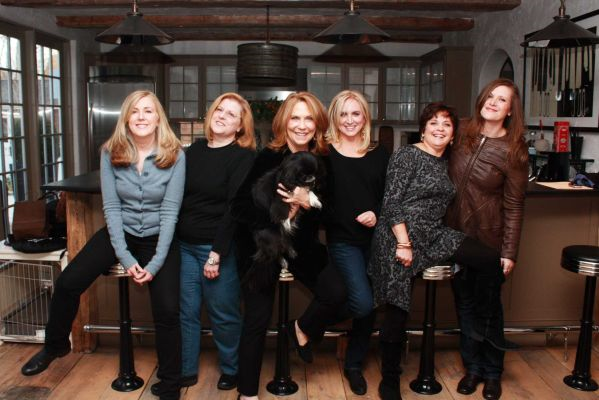 Yes, another blog about the Chapter 1 Book Club's big night coming up Thurs. Feb. 13 at 6 p.m. at the Pearl Public Library. 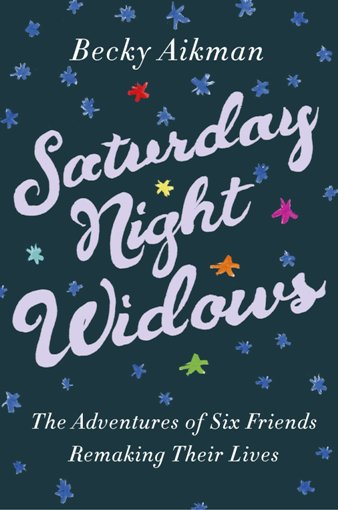 Just in today, 10 copies of Saturday Night Widows are now available at the Pearl Library's circulation desk! Don't wait too late to come check one out! You don't want to miss this! Cecelia has arranged a Skype (visual using webcam) visit with Saturday Night Widows author, Becky Aikman. WOOOO HOOO! Go, Cecelia! Journalist and former Newsday reporter, Aikman lost her husband to cancer when she was in her forties. Sad and lonely she tried a support group. All she felt was more sad, and that was not working for her. She knew she had to get busy reinventing herself. Can you believe that you get an opportunity to meet and chat with this wonderful author via Skype?! Amazing! The Chapter 1 Book Club will meet Thurs. Feb. 13 from 6 p.m. to 7 p.m. No registration is required, and you do not have to commit to joining the group. Just come on by and hear a very interesting story LIVE! 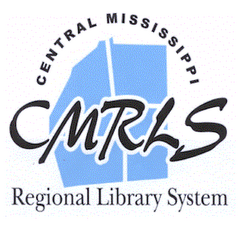 The Pearl Library Creatively Features Mississippi's Magnetism! The Love Mississippi magnet, sporting a sweet, red heart, lies beside the Shrinky Dinks bag. If you have a real heart for our beloved state, and love crafts, you absolutely must come be a part of the Pearl Public Library's Feb. 11, 6 p.m. Simply Crafts. On tap is SHRINKY DINK crafting! Eleanor says "Shinky Dinks aren't just for kids anymore! This month we'll create a Love Mississippi magnet using Shrinky Dink plastic. We'll outline and paint the state of Mississippi." If you are already getting nervous just thinking that you might have to freehand draw the shape, "Don't fret. We'll trace it," said Eleanor. "We'll add a heart detail near our hometown location. It's so fun to watch the plastic shrink and curl in the oven!" That does sound like a ton of fun! Don't miss it. No registration is required and all supplies are furnished. We will definitely see you here! That takes care of the evening session of February's double header Simply Crafts. Shirley is raring to go with her second RAGS TO RUGS, a repeat of January's craft session, at 10:30 a.m. Tues. Feb. 11. "It takes a lot of fabric to make a rug," said Shirley. So, please remember to bring in any old t-shirts you might have lying around. Folks have been dropping off fabric in the donation bin next to the library's circulation desk. It's greatly appreciated. Keep it coming! No registration is required, but would be helpful. The first three folks who register will get a small prize. You can contact the reference desk to register or get more information. Come on. Join us! Let's cut...uh...weave a rug together!!! Pearl's Chapter 1 Book Club Hosts Live, Visual Talk With Author! Cecelia, leader of the Pearl Library's Chapter 1 Book Club, has arranged a Skype (visual using webcam) visit with Saturday Night Widows author, Becky Aikman. You don't want to miss it! Mmmmm! That's Some Sweet, Sweet Lovin' ...Pearl Library Style! February is Library Lovers' Month, and the Pearl Public Library is gearing up to do it again! You know what I'm talking about! It's a huge patron favorite! The sixth annual Come in From the Cold With a Good Book, co-sponsored by the Friends of the Pearl Library, is back! It's a time when delicious treats abound putting smiles on so many faces! It's a PARTY! 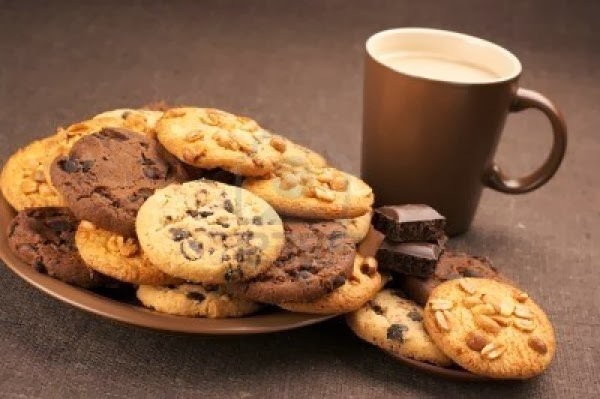 The event just wouldn't be the same without lip smackin' cookies, donuts and hot, smooth Community Coffee! OOOOH-YEAH! You really don't want to miss it! Come In From the Cold With a Good Book starts Wed., Feb. 12 and runs through sweetheart day Fri., Feb. 14. Hey, don't have plans for your special Valentine? Then this is perfect for you! Your sweetie will love you for it! Patrons enter from the foyer of the library to a table full of yummy treats and comforting Community Coffee! You'll be met with warm smiles and learn about the Friends of the Library, the group that supports the library in so many ways! You might even like to join! The event times are 10 a.m to 6:00 p.m. Wednesday and Thursday and 10 a.m. to 3:00 p.m. on Friday - Valentine's Day! The Pearl Library couldn't do it without generous donations from area businesses that love their library! That Special Touch, Community Coffee, The Donut Factory, Dunkin' Donuts, Walmart, Sam's and Western Sizzlin' are furnishing all the treats we need for the three-day celebration! Sweet, sweet lovin'! You know that's what it is! It's all free, but donations to the Friends of the Pearl Library are kindly and sweetly welcome! There's no doubting it. The Pearl Library LOVES its patrons!!! THE CRAFT THAT KEPT ON GIVING! SIMPLY CRAFTS ARTISTS SHOWING OFF THEIR WORK! WOW! Eleanor and her Simply Crafts group, at the Pearl Public Library, sure had a reeeeeeeeally good time making DENIM GIVING TREES! Just look at the smiles on those wonderful faces! 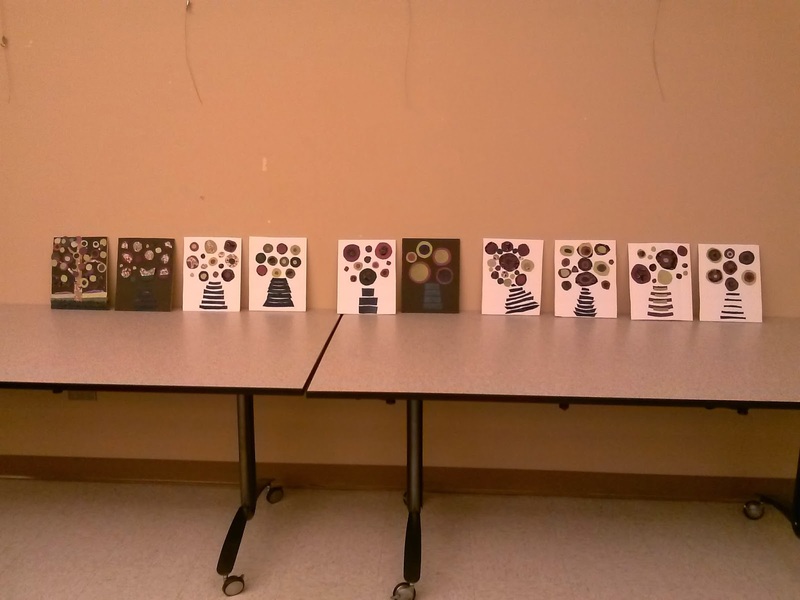 And, check out the diverse tree designs below! She sure hit a home run with this fantastic craft idea! You go, El!!!!!! 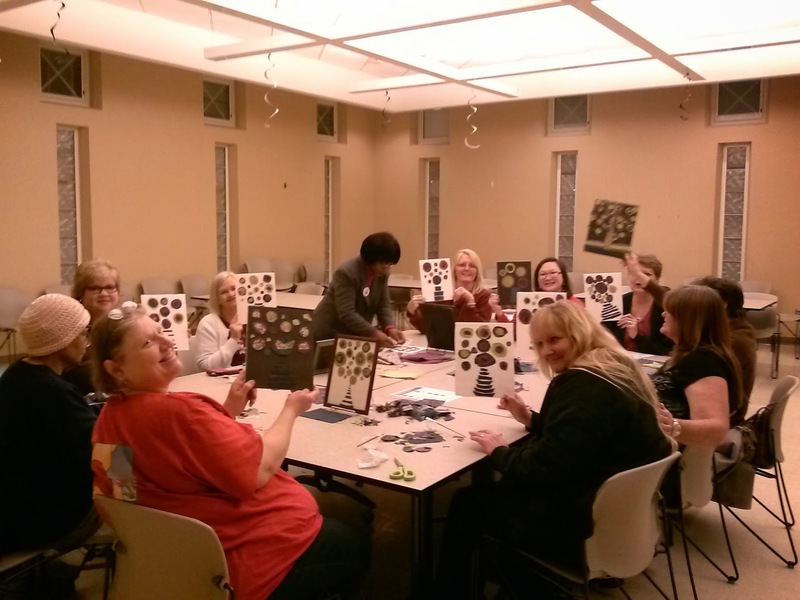 The DENIM GIVING TREE was the night-time (6 p.m) featured craft of the Pearl Library's first ever, double header Simply Crafts day Tues. Jan. 14. Shirley headed up the morning's RAGS TO RUGS craft (10:30 a.m.) and said it was a lot of fun too. 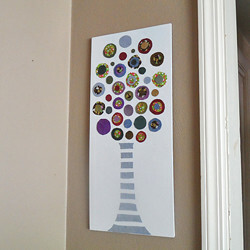 She plans to repeat this craft for February and March's Simply Crafts double headers! 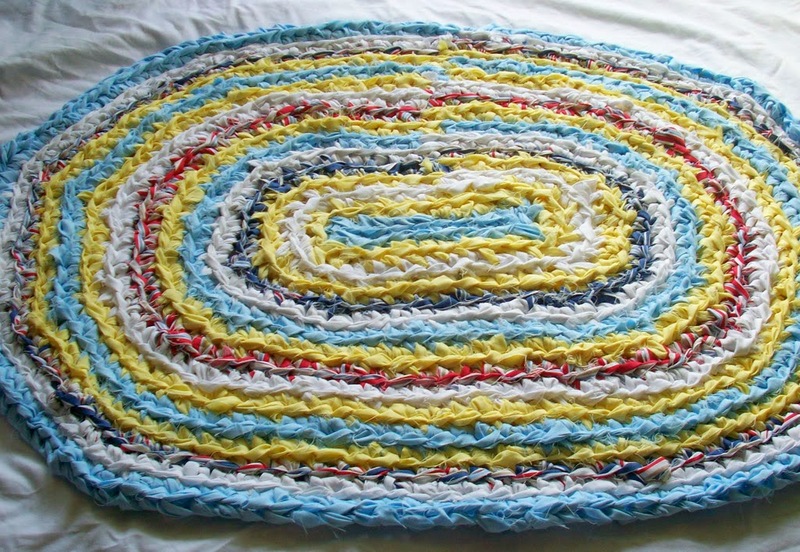 It takes mega cloth to make a rug so don't forget to bring those ol' t-shirts! Just a reminder, for those of you who might be frequenting the library for various reasons, the library is accepting cloth donations. A plastic bin is located near the circulation desk! Hey, uh...just between me and you, the buzz is that folks are discovering they can keep on top of craft news - RIGHT HERE! - and plan to keep coming back! SO, stay tuned - RIGHT HERE! - and find out what's Eleanor's next, nocturnal double header installment of Simply Crafts coming Tues. Feb. 11! You know it's going to be reeeeeeeeeeeeally good!! COME ON AND JOIN IN THE FUN! WE'LL SEE YA HERE! Exquisite Hand Carved Wood Art Exhibit At The Pearl Library! The Pearl Public Library is showcasing, Expressions in Wood, now through the month of February - in honor of Black History Month - the magnificent woodcarving art of Oklahoma native, George Berry, Sr.
A hand carved dolphin, hippo, turtle, bison, pig and wolf are only a few that are among the breathtaking, wooden animals that grace the library's foyer. Waterfowl, eagles, owls and horses are onsite to admire as well. Hand carved lapel pins in the likeness of a hummingbird, butterfly and several leave pins are also in the exhibit. 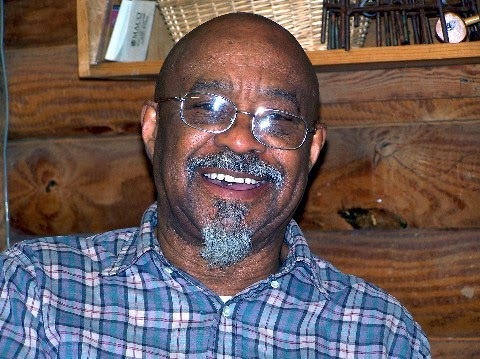 Berry, now a resident of Pearl, moved to Mississippi in 1972 to teach industrial arts at the Piney Woods Country Life School where he retired in 1985. He's been carving wood since he was 6-years-old which means he has been creating art almost all his life. Berry shows a great appreciation of the beauty of wildlife through fine, delicate detail. His work is so impressively done, it's quite hard to believe it's actually hand carved. It seems almost impossible and truly demonstrates Berry's genius. For those who love outdoor sports, hunting dogs and catfish are Berry's homage to Mississippi culture. An honoree of the Mississippi Arts Commission, Berry received the Governor's Awards for Excellence in the Arts for Artistic Achievement in 2001. Berry's wood carved sculptures are exhibited in numerous places in Jackson and Oklahoma and other private residences and offices throughout the U.S.
Berry is a charter member and Fellow of the Craftsmen's Guild of Mississippi and is on the Guild's Board of Directors. You really do not want to miss a great opportunity to see the Expressions in Wood exhibit! The Pearl Library invites everyone to come by. If it's your first time to visit the library, take a look around and see everything your library has to offer! We sure hope to see you here! 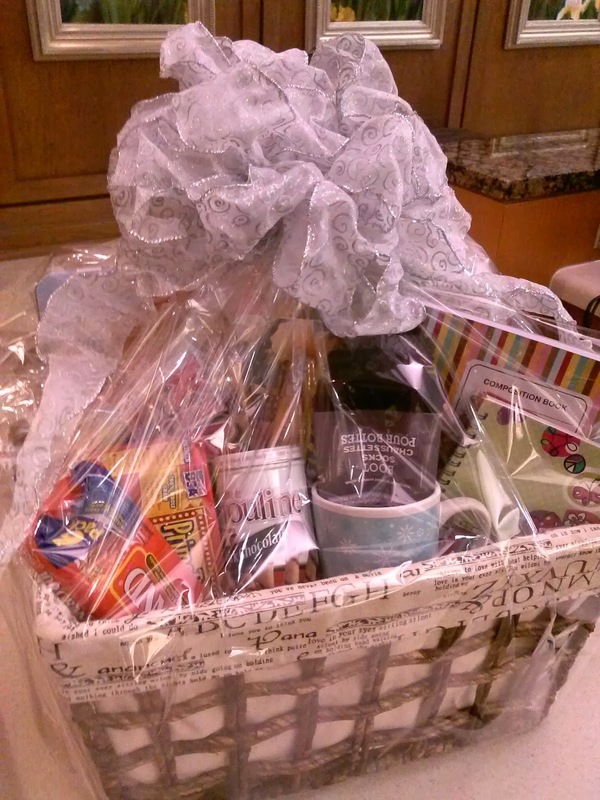 WIN THIS HUGE, AWESOME GIFT BASKET! It's easy to win this fantastic gift basket designed by the Pearl Public Library's own Eleanor, reference supervisor and coordinator of adult programming! The basket is yours if you read the most books by Feb. 28. The adult winter reading event is called Snuggle Up and Read, and is well underway. Library patrons are getting supercharged when they see this beautiful grand prize perched upon the reference department's work island. Uh-huuuuuh. It's like Christmas morning! Hey, even simply hearing about the grand prize starts patrons grabbing for books! Here's how Snuggle Up and Read works. You read five (5) books, turn in a reading log and get a small prize for your first reading log only. Turn in as many logs as you wish. All logs are counted. The person who reads the most wins the grand prize, a gorgeous basket loaded with goodies! Don't wait to get in on this fun activity. Do it now! You just might win! It's just a few days away. The Pearl Public Library's double dose of Simply Crafts, Tues. Jan. 14 is just right around the corner. The regularly scheduled Simply Crafts program will be held at its normal time at 6 p.m.
Eleanor Jones, reference department supervisor and coordinator of adult programming, is the the nocturnal, craft leader. She will feature the DENIM GIVING TREE! No registration is required and you don't have to bring your own supplies for this craft. However, denim donations are being accepted now. The new addition to Simply Crafts is the morning session where you will need to register. Hey, you want to register for this fast to try and win a prize! Yes, you read that right! The first five (5) folks to register get a free prize! Shirley Dennis, the library's branch manager, is the event leader and will be presenting RAGS TO RUGS! The program is Tues. Jan. 14 from 10:30 a.m. to 12 - Noon. You can contact the reference department to register. Please bring your own supplies, old t-shirts, needle, thread and scissors, and get ready to cut a rug!!!! Don't miss out! We really want to see you there! NOTE: The library is presently accepting cloth donations. A plastic bin has been placed near the circulation desk for your convenience! Chapter 1 Book Club reaches for "Air"! You don't want to miss this! Cecelia and her group, at the Pearl Library, are reading a great Mississippi author's work for January's Chapter 1 Book Club meeting. Deborah Johnson's (a.k.a Deborah Johns) The Air Between US is the book of the month. 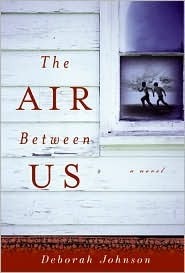 The Air Between Us takes place in segregated Revere where, like in most Mississippi towns, back in the 1960s, black people live on one side of the town, the whites on the other. They rarely mix, but then how does 10-year-old, Willie B. Tate, Jr. known as Critter, who is black and so short he can barely see over the dashboard, end up driving white, Billy Ray Puckett- wounded in a suspicious hunting accident - to a whites-only emergency room? In The Air Between Us readers are kept guessing up to the very end! You absolutely must read this book, and come to the Chapter 1 Book Club meeting on Thurs. Jan. 9 from 6 p.m. to 7 p.m. You don't have to reserve a spot, and you don't have to join the club, but do come by. We'll see you then. Deborah Johnson is a native of Columbus and has written several books with her next novel, The Secret of Magic, slated to be released Jan 21, 2014. She is the editor for Genesis Press in Columbus, Mississippi and Executive Director of the Colom Foundation. Before moving to Columbus, she lived for eighteen years in Italy where she, for a time, worked as an announcer for the Vatican Radio in Rome. She has written several books and received an award from the Mississippi Library Association for her novel The Air Between Us.